Rewrite, an anime based on the Key Visual Arts visual novel of the same name, is set to be released in July of this year. The show, which takes place in Kazamatsuri, revolves around Kotaro Tennoji and his interactions with his classmates Kotori Kanbe, Chihaya Ohtori, Akane Senri, Sizuru Nakatsu, and Lucia Konohana. To take a sneak peek of what the show has on offer, here’s the promotional video for Rewrite. 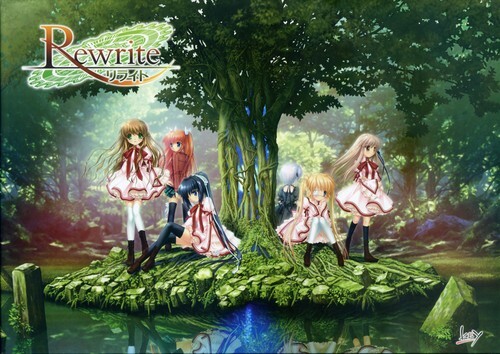 Much of the staff who worked on the game version of Rewrite will be reprising their roles for the anime. The voice cast is one area in which this occurs, but the same goes for the music composers. Names from Key Visual Arts include Shinji Orito and Jun Maeda who have worked together on previous Key Visual works like Kanon, Air, and Clannad. Ryō Mizutsuki also has worked with the Key composers as an arranger for Little Busters while Maiko Iuchi brings her experience as part of I’ve Sound to the team. Last, but not least, Soushi Hosoi has worked on his fair share of visual novels as well. I’ve long ceased to follow up on Key Visual’s other VNs beyond Air, Kanon, and Clannad, so this probably won’t be something I’d pick up. The music in the PV is a mix of light and darker atmospheric fare that doesn’t readily catch my attention, but I’m curious to see Maeda’s tracks in action since he can capture those heartfelt moments really well. Jun Maeda only really composed three tracks in the game, one being a piano-based (can’t find the right word) atmospheric title screen music titled “Tabi,” and the other two being vocal arrangements of that track. Though based on the latest updates, looks like he will also compose another song for the anime. I don’t think you’d be surprised that these three songs are actually loved by the fandom. As for the PV, the first track used is a piece played during slice-of-life moments and is composed by Shinji Orito and arranged by Maiko Iuchi, while the second track (yes the ominous part and piano solo part belongs to the same track) is composed by Soushi Hosoi. They’re titled “Fertilizer” and “Black Star Sickness,” respectively. In any case, the best part of Black Star Sickness wasn’t even included in the PV. Awesome! Thanks for the heads up on that. No surprise that anything Maeda touches is generally solid overall in the sentimental, but not excessively so kind of way. Based on your response, it’s high time that I’ve checked out the Rewrite OSTs. Long overdue!